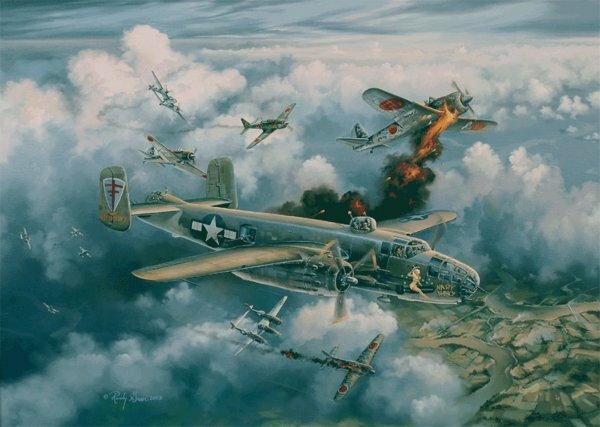 with an overall size of 18" x 24"
On 10 April, 1945, the 42nd Bomb Group’s Mission #48 was assigned to the men of B-25J "Nasty Nancy". Their job was to fly a racetrack route at 10,000’ over the city of Saigon, in broad daylight and lure Japanese fighters into a brawl. Japanese fighter groups stationed near Saigon had been taking a continuous toll on allied aircraft operating in the area. The plan was to lure the fighters into a trap using one lone B-25 as bait, the battle-weary "Nasty Nancy". Waiting high above "Nasty Nancy" in the thin cloud cover were American P-38’s poised to attack when the call sign "Little friends, Come Down and Play" was given. The ensuing battle saw "Nasty Nancy’s" tail gunner, William Outlaw (right) duel approaching fighters with his .45 caliber pistol after the jamming of his heavy machine guns. Many of the Japanese fell for the ruse and a considerable number were subsequently shot from the sky. The crewmen of "Nasty Nancy" were officially credited with 4 kills, and lived to tell the tale of this wild "Shoot-Out Over Saigon".